Look, I know that you’re still waiting for Elder Scrolls 6 to be announced, and I am too. But if you really want to be shown how much we all took dragons for granted in Skyrim, look no further than Elder Scrolls Online: Elsweyr for the answer. In Skyrim, you may well have been able to shout dragons out of the sky, breathe fire right back at them, and have had the ability to ensure that they stayed dead by sucking out their souls with your dragonborn blood. But this is Elsweyr – the balance of power is different in Tamriel this time around. “The first time you see a dragon overhead will surprise you, it totally gives you a Skyrim flashback,” Matt Firor, ESO’s Game Director, tells me. Unlike in Skyrim, you will only have as much power over the returning dragons as those NPCs who would so often run around like headless chickens as soon as one landed on a nearby inn. Yes, just like those civilians who thought that punching a dragon would somehow help, instead of taking the opportunity to run back into their houses like any sane person might. After spending some time playing Elsweyr and chatting with Firor, I'm fairly convinced that the upcoming expansion is made for Skyrim addicts and ESO veterans alike. In fact, if you wanted more of a challenge in Skyrim – if you found yourself routinely beating dragons with your hands tied behind your back by the end – then Elsweyr is certainly for you. 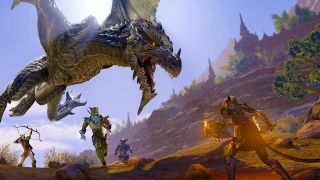 Featuring dragons in ESO for the very first time, these monstrous creatures are the top-tier challenge in the expansion and are part of the main storyline. But be warned: They’re not for the faint-hearted. “Well, Skyrim’s story was intrinsically about dragons, right?” Firor begins, before noting that in ESO “you’re living in a world where you’re not Dovahkiin, so dragons are really tough.” And he’s right about that one. “You have no power over dragons,” Firor continues, detailing the changes the ESO team has had to make to the fan-favourite creatures. “You don’t talk to them, you can’t shout at them, and you can’t use their abilities against them like you do in Skyrim – you’re like an NPC in Skyrim. The way they reacted to dragons, that’s you in ESO”. “If you’re on your own, you should just run away!" Bold words, but it’s true. You can’t beat them on your own, and so fighting them really makes you feel like you’re an NPC – albeit an NPC with powers over destruction magic, nature, or even just someone who’s unnaturally good with a bow, sword or shield. I tried to take one on and trust me, it didn’t end well. Thankfully, I escaped from it intact… but that was only because it flew away. These dragons are fearsome, meaning you’ll need a whole group to even stand a chance at beating one. Plus, as you’re not the dovahkiin, those big flying reptiles don’t stay dead. In fact, Firor tells me that “you don’t really kill a dragon unless you eat their soul (like in Skyrim when you actually consume their soul), so once you beat them down they die for a while, but they’re not fully dead”. They come back, and even if you’ve killed them before you’ll still be able to find them as events on the map – kind of like Anthem’s World Events. So how do you even go about beating them? “If you’re on your own, you should just run away!" Firor is quick to advise me, although he's just as quick to note that it doesn't necessarily get any easier with friends by your side. "It scales, it’s a world event, so I believe you should probably have at least four [players]... if you have more it gets tougher and tougher.'' Hey, no one said a life of battling dragons was going to be easy. Dragons aren’t the only thing that’s revitalising ESO in this year-long Season of the Dragon campaign. You can now, for the very first time, play as a Necromancer, which (of course) gives you powers over the undead. But even though you might have a ton of fun pulling skeletons from the dirt, or healing your teammates using the unholy power of death, ESO’s NPCs aren’t a fan of that kind of dark magic. In fact, if you cast a necromancy spell in the middle of a town, the guards are liable to react unfavourably. Firor tells me that “some of the guards are just going to jump on you and beat the hell out of you” if they catch you peddling that kind of morbid magic in their neck of the woods. This is bad news for anyone who’s trying to roleplay a horribly misunderstood necromancer, but a dream come true for those of us who take a special type of delight in roleplaying evil characters. Come on, you’ve quick-saved and then tried to massacre every NPC in a nearby town... right? Oh okay, don’t act like you haven’t. There’s no judgement here. ESO: Elsweyr is changing the rulebook, and if you’re a Skyrim addict you should prepare for a surprise. With the substantial changes to dragons and the addition of the necromancer class, now is a great time to jump into ESO for yourself and see what all the fuss is about, especially if you’ve got a bit too reliant on Thu’ums in Skyrim… don’t say I didn’t warn you. If you’ve played Skyrim to death and are in need of a new game, here’s the best RPG games you can play right now, or look below to see the games you’ve got to look out for in 2019!